The rise in the number of tourist arrivals in Sarawak by 8.1 percent from January to September this year compared to the same period last year indicates the growing opportunities available to those seeking a career in the hospitality sector. Recognizing the contributions of the tourism and hospitality industry as a key driver for socio-?economic progress, INTI College Sarawak is offering the Certificate in Hotel Operations with the first intake of students in January 2013. “The Certificate in Hotel Operations programme, developed by INTI in collaboration with professionals from the industry, prepares students for a wide range of hospitality related careers. Students will gain hands-on experience in various areas of hotel operations such as Front Office, Housekeeping, and Food and Beverage Management. Graduates can look forward to exciting and rewarding careers in the hospitality industry in positions such as Banquet Coordinator, Customer Service Representative, Event Coordinator, Food and Beverage Assistant, Housekeeping Supervisor and Sales Executive,” said Ivy Lau, Chief Executive and Principal of INTI College Sarawak. 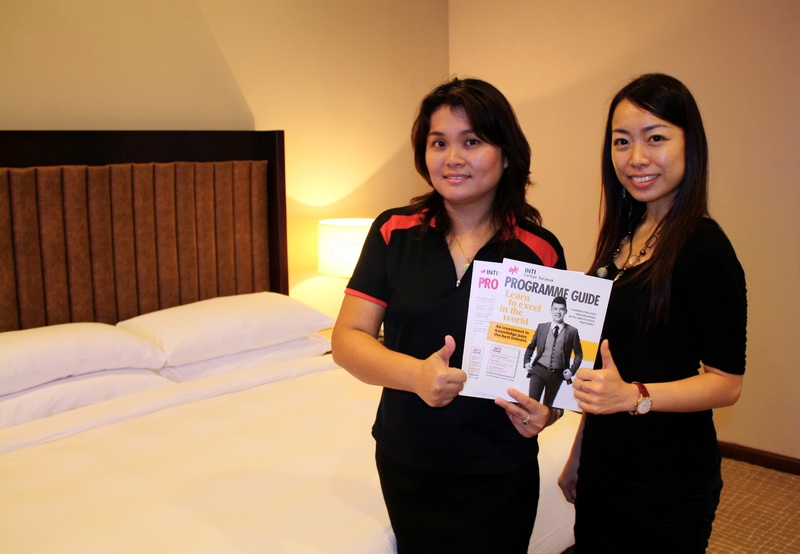 Ivy Lau (left) with Carleen Teo, Head, School of Hospitality in INTI College Sarawak’s mock hotel room, which is among the college’s impressive training facilities. In addition to boosting employability prospects and career advancement in the hospitality industry, the Certificate in Hotel Operations provides a strong foundation for those who wish to pursue the Diploma in Hotel Management or Diploma in Culinary Arts programme at INTI. Students who have completed SPM with a minimum of 1 credit are eligible to enter the certificate programme. The duration of the programme is 1 year and 4 months inclusive of a 4-month internship. Innovative learning, global exposure and personal development are all part of the holistic learning process at INTI College Sarawak. With the construction of INTI College Sarawak’s new on-campus production kitchen, training restaurant and mock bathroom, scheduled for completion by the end of the year, the learning experience of the students will be further enhanced. INTI also enjoys close links with industry partners such as the Borneo Convention Centre Kuching (BCCK), Hilton Kuching, Hyatt Regency Kinabalu, Shangri-La Tanjung Aru Resort & Spa, Grand Dorsett Labuan, Crowne Plaza Mutiara Kuala Lumpur, Impiana Hotel KLCC and many other industry leaders. This enables INTI’s students to experience internship with these fine establishments which gives them a head start in their hospitality careers. By having relevant hands-on experience, they are able to develop new skills that cannot be acquired in a classroom. Internationalism is an important pillar that holds up institutions of the Laureate International Universities network and the opportunity for members such as INTI to share knowledge, thought processes, best practices, academic talent and resources across the distances makes this ‘Laureate advantage’ a unique one. For INTI College Sarawak’s students, this provides a global study perspective and hands-on training opportunities across the largest and fastest growing network of private universities in the world. Through the Semester Abroad Program (SAP), for example, INTI’s students can take advantage of the opportunity to spend a semester abroad at any Laureate institution without paying international student fees. The Laureate Visiting Fellows initiative on the other hand brings international thought leaders and academics to INTI to talk on topics which are current and relevant to their learning and teaching. Students of INTI benefit not only from the institution’s strong track record, but also gain from the global synergy and resources that Laureate International Universities provides. INTI is part of Laureate, which has a presence in 29 countries, with more than 60 accredited campus-based and online universities and 130 campuses, serving over 740,000 students globally. The Certificate in Hotel Operations programme is now available for enrolment and classes will commence on January 7, 2013. For further information, please call 082-570888 or visit INTI College Sarawak at Jalan Stampin Timur in Kuching.